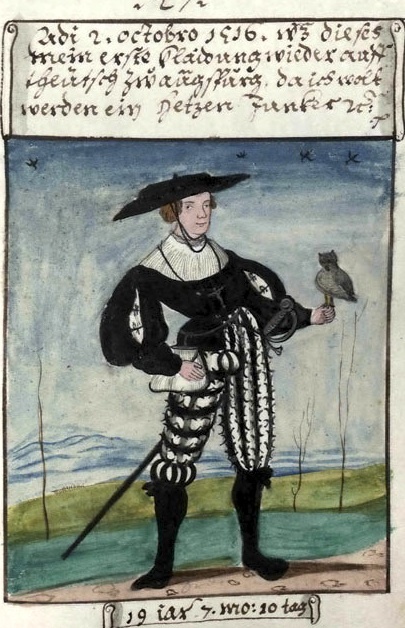 I've just finished reading Ulinka Rublack's Dressing Up: Cultural Identity in Renaissance Europe (Oxford, 2010) and came away from it with a newfound appreciation for how truly odd early modern clothing was -- and how important these clothes were in people's daily lives. Rublack, a Cambridge history professor, is very shrewd in noting that obsolete sartorial choices like codpieces, corsets or tight-fitting doublets were about more than adornment: they helped to structure the limits of physical movement while also expressing personal allegiances, social groupings, nationalities, and religious faith. 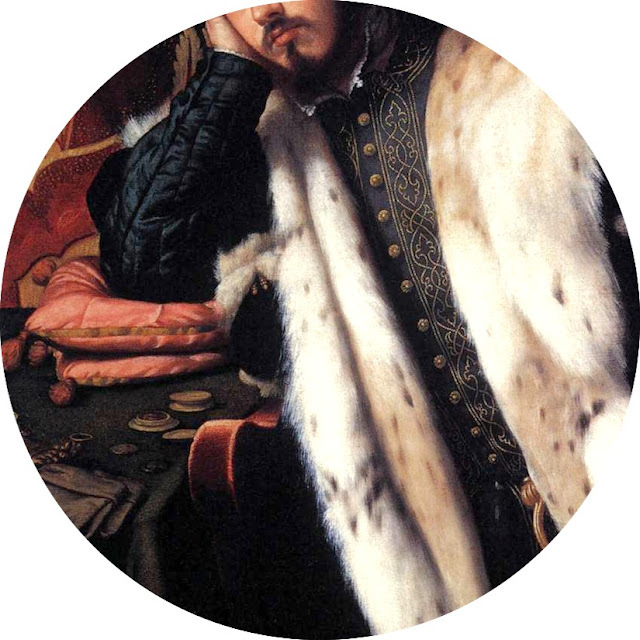 What is more, early modern clothing offered a window into the inner emotional states of the wearer in a world that was far less receptive to that sort of thing than our own. 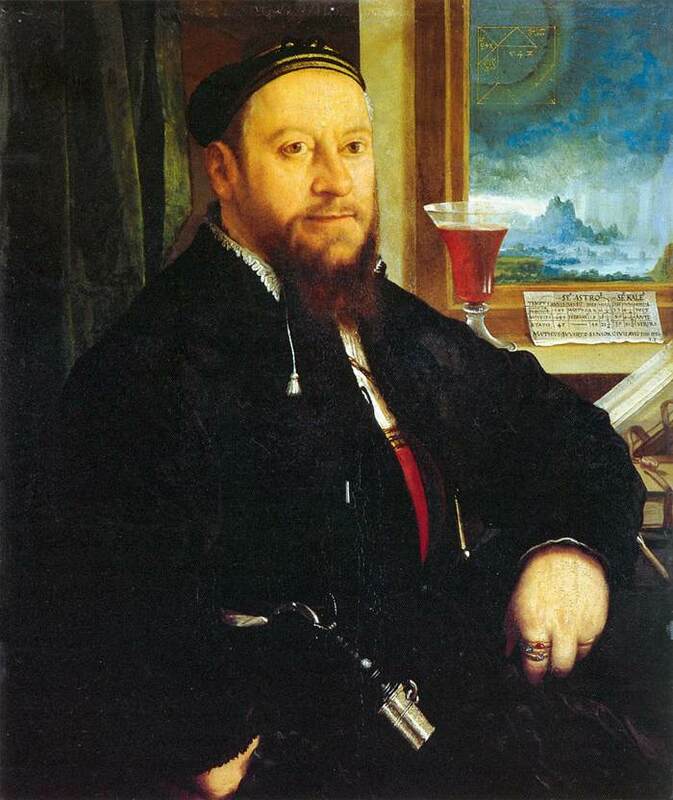 Matthäus Schwarz depicted by the painter Christoph Amberger in 1542.
including his horoscope, visible above the wine glass. 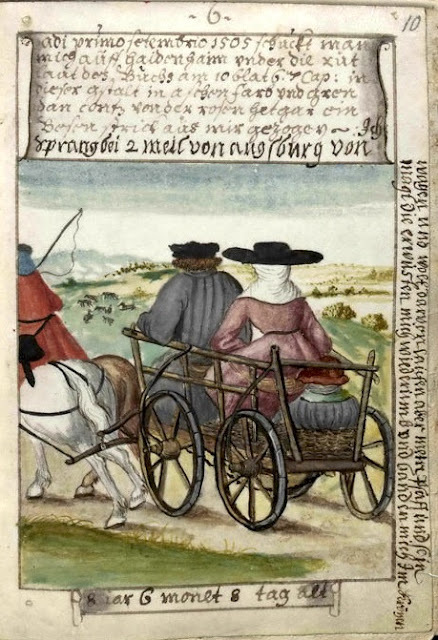 To me, by far the most striking piece of evidence Rublack analyzes in her book is a vellum manuscript of some one hundred and sixty five watercolor illustrations from sixteenth-century Germany. Each one depicts the same man: Matthäus Schwarz of Augsburg (1497-1574), a successful merchant who worked as an accountant for the powerful Fugger banking house. What makes this book extraordinary is that it depicts Schwarz and his clothing in every stage of his life, from what he called his “first dress in the world” as a days-old infant to the somber robes he donned as an ailing man of sixty-seven. 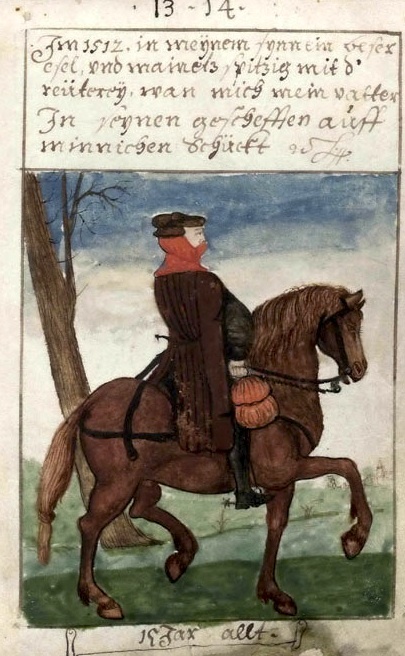 Schwarz began to commission the illustrations from local Augsburg painters starting when he was twenty-seven, and in its pages we see a man's life as if in a film: the small child in its early pages grows to become a proud 15-year-old riding a horse, then a young man wearing elaborate Italian suits of red silk. 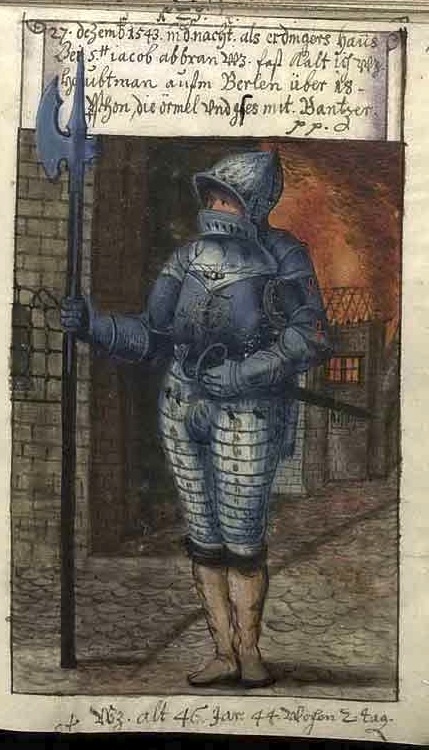 When Augsburg is threatened by attack, an older Schwarz is depicted in a suit of gilded armor protecting his city. When his employer Anton Fugger is married we see Schwarz as a handsome man of thirty attending the wedding in rich velvet with a dueling sword at his side; when Fugger dies, Schwarz is a sixty-three wearing black robes and a wintry white beard. Schwarz even had himself depicted naked (front and back!) for reasons that scholars are still debating. Simply put, this is one of the most extraordinary early modern historical sources that I've ever seen. 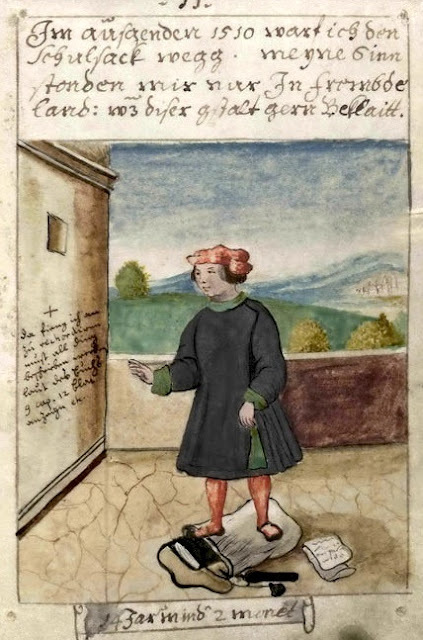 Rublack's publishers do a good job of including numerous color illustrations from what Schwarz called his Klaidungsbüchlein, or “Book of Clothes,” but a printed book can't possibly include all of them. Below I've selected some more that stood out to me. The opening pages of Schwarz's Klaidungsbüchlein, showing him as a twenty-three-year old. 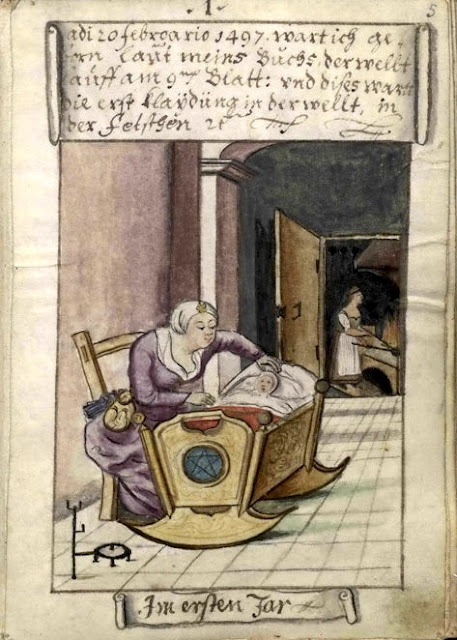 Schwarz as a new-born infant. Note the five-pointed star on his cradle! Perhaps a charm against evil? At five years and four months old, a pious child. Riding in the back of a wagon with his parents at eight and a half years old. Hawking in the countryside with a friend, nine years and four months old. 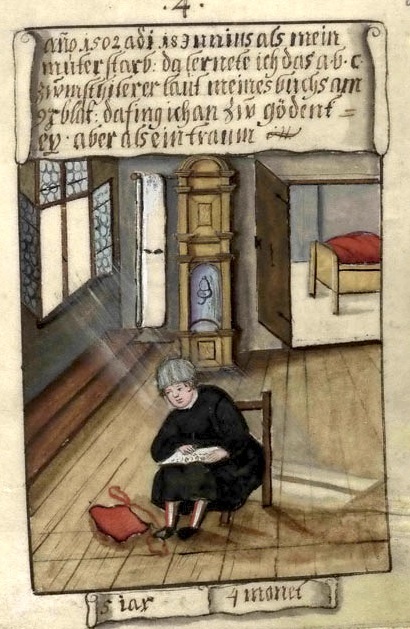 Schwarz trampling on his schoolbooks as a fourteen-year-old. Proudly riding his horse at fifteen. 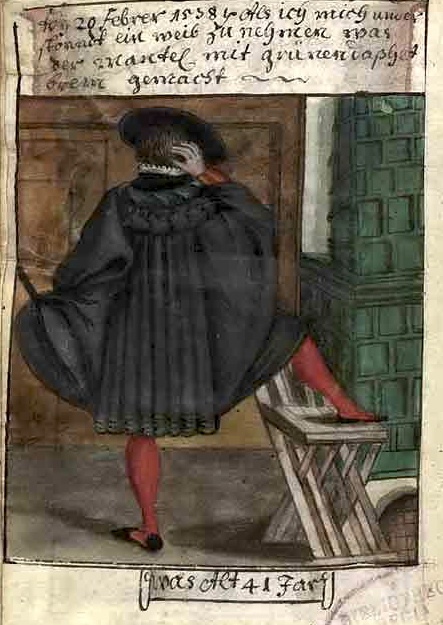 Hawking at nineteen and seven months in a fashionable suit with codpiece, sword at side. 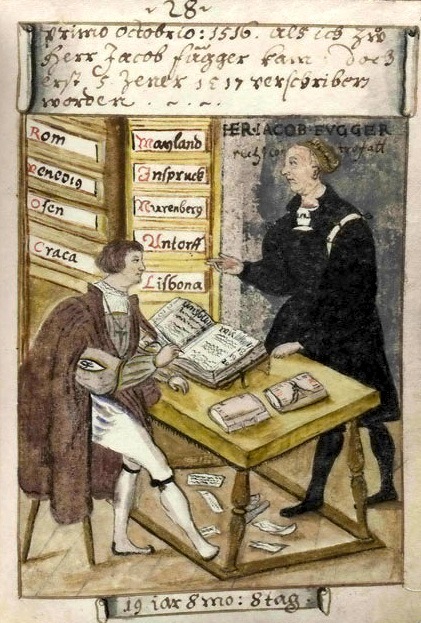 A month later, working as a clerk to Jakob Fugger, one of the richest men of his era, and perhaps of any era. Practicing at sword fighting, twenty-one and two thirds. Some bold color choices in this suit! 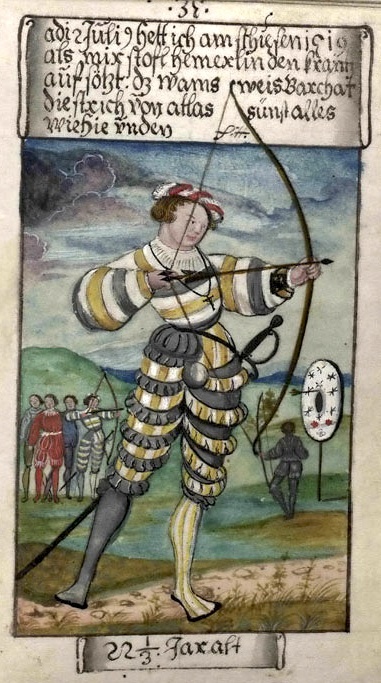 At an archery contest at twenty-two years of age, wearing a similar suit and a foppish ruffled hat. different varieties of mourning dress. a little put out by the stray dog peeing at his right! 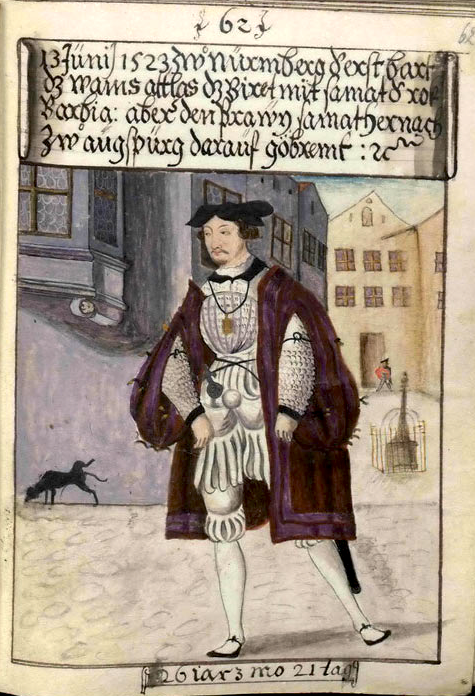 Note the money-sacks at his belt and the fashionable cloak with arm holes. Stark naked at twenty-nine. Schwarz noted in relation to this picture, "I had become fat and large." 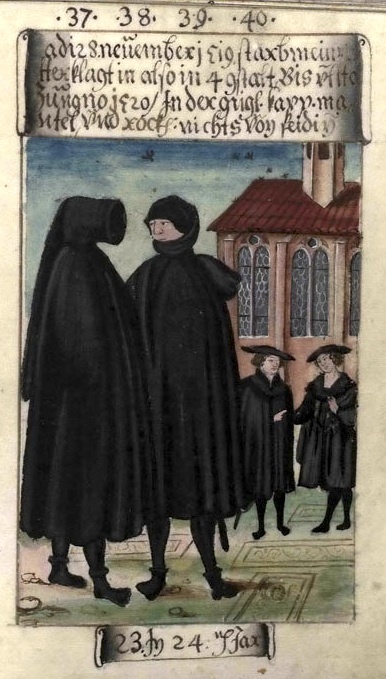 Schwarz at forty-one displaying the new cloak he bought to celebrate his pending nuptials. Wearing plate armor and bearing halberd in preparation for the attack of Emperor Charles V, age forty-six. Now middle-aged and bearded at forty-eight, Schwarz walks with his squire (and perhaps son? I can't read the caption). 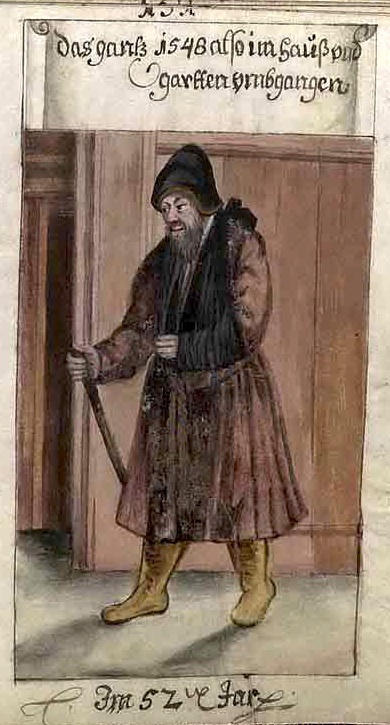 An old man: Schwarz suffered a stroke at fifty-two. He is shown here in recovery at home. I would guess that he suffers from partial paralysis of the left side in this picture, given the sling and staff. 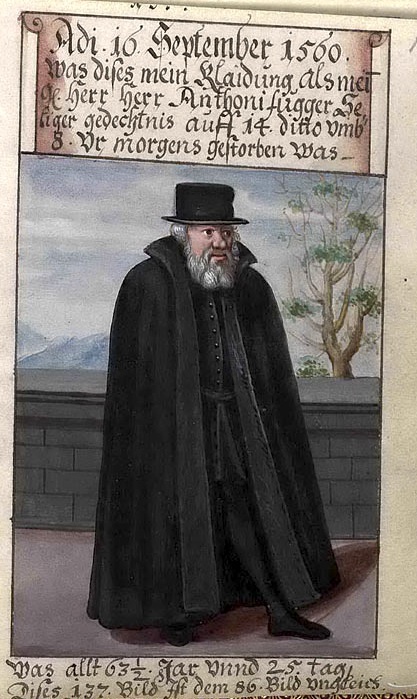 the modern business suit, a sixty-three-year-old Schwarz attends the funeral of his employer, Jacob Fugger. Amazingly, these incredible images actually appear to be sub-par copies of the original paintings - as I was writing this post I realized that the images in Rublack's book are slightly different, with a greater level of detail and brighter colors. I'd urge anyone who found this post interesting to pick up Rublack's Dressing Up - I hope you enjoy it as much as I did. It's one of the best-illustrated history books I've ever read, and it is also one of the most boldly-argued and insightful interpretations of early modern European culture to appear in the last few years, I think. As for the attribution of these images, I'm actually unable to say with any certainty. I found them as a result of a Google search for "Matthaus Schwarz" that turned up this mediafire upload of a complete scan of his book. I noticed that this German book blog posted images from what would appear to be the same copy (given the watermark). 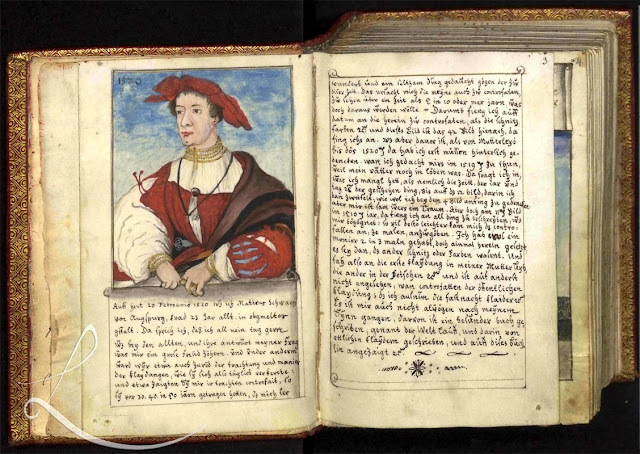 If readers have any information about who scanned the images or where they are held, please let me know [edit: thanks to John Overholt for pointing out that the original manuscript is owned by the Herzog Anton Ulrich-Museum in Braunschweig, Germany]. As ever, I invite comments! Hi! My German is very bad, but I think that German blog you mention is actually not a blog but some sort of online catalog for an exhibition.There are more images there under "Exponate/Fotos" and under the "Impressum" you can find some names of the people behind this project.I hope I'm not totally off:)Also, if I translated one of the comments under the post in that German blog, two copies of the book were made. Hope this helps a bit, maybe this will give you another leed to follow. I love your blog, love this post and I love this book(thank you for posting), it's very beautiful and a very strange thing to make, I think. Thanks again for a great post! Thank you so much for this wonderful post & reading suggestion. 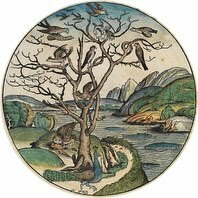 The Klaidungsbüchlein (wich I had not known ‒ what a shame!) is really an outstanding source. Those paintings are remarkable and the captions are mostly as funny too (mostly because of the odd language). 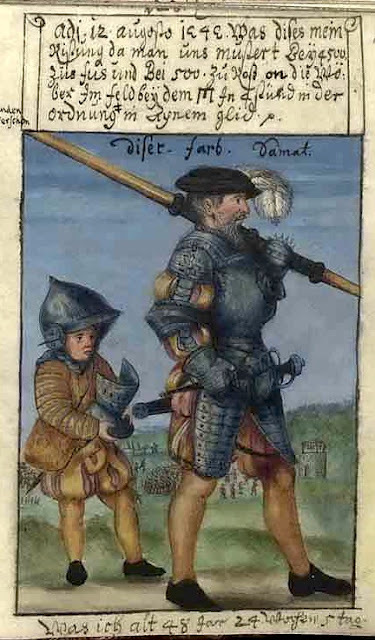 The second depiction of Schwarz in armor says nothing about the squire at his side, by the way: “a.d. 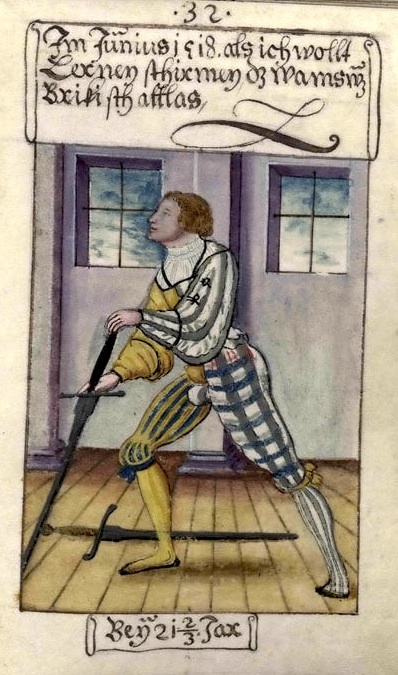 August 12th 1545 this was my armor at the review [...]”. Thank you again and keep the posts coming! Okay, so I'm fairly astonished at the length and depth of this post. What a great resource for renaissance clothing! 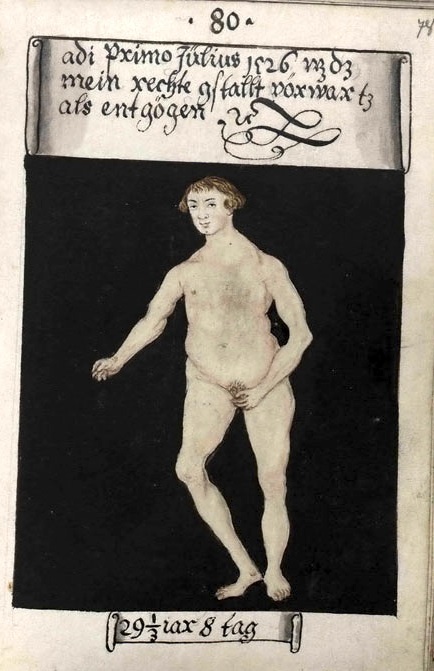 I laughed out loud at "Schwarz even had himself depicted naked (front and back!) 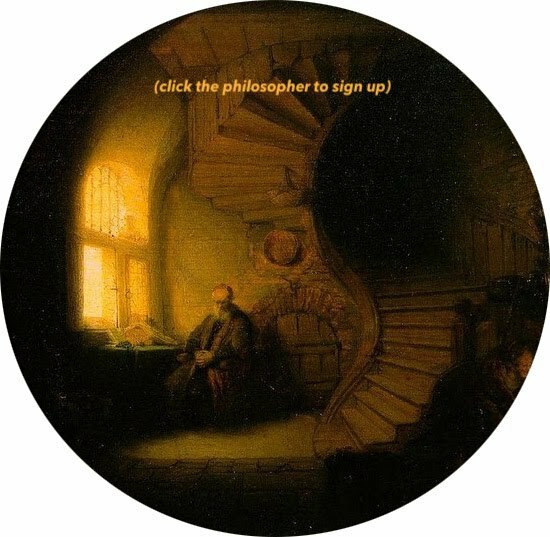 for reasons that scholars are still debating." 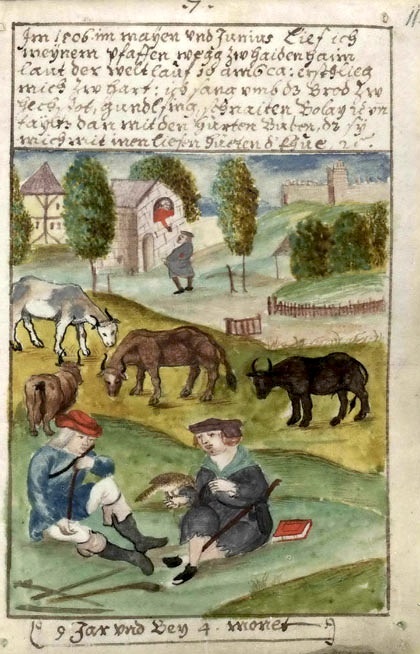 Great post and thank you for the medieval clothing 101. I’m an assistant professor of history at UC Santa Cruz with a special interest in the histories of science, medicine, technology, print culture and imperialism in the early modern world. Res Obscura is a compendium of images and texts I come across in my research. To contact me, please visit my personal site.